Some thoughts on the words to Taps. A few weeks ago, my mind wandered to the words to the song “Taps”. I was thinking about William’s service held eight months ago today and the bugler playing Taps while my sister clasped my shoulder from behind me. I really think, at that moment, God allowed her to hold me in one piece. It was the closest I had felt to coming unglued since it had all started. I don’t know why the words to “Taps” suddenly became important to me. I went on an internet search, and this is the information in found at www.tapsbugler.com. “Day is done, Gone the sun, From the lake, From the hill, From the sky. When the sun set on August 23, life as I had known it ended. When August 24 dawned, I started a whole new life. And while I didn’t have a choice about starting down this new path, I did have a choice on how I would do it. I could do it in faith, trusting God that all would be well, or could do it in my own strength. I could safely rest in God’s presence, or I could shake my fist at Him and wail about my circumstances. I chose God then, and I choose Him now. And though my heart was cracking while the bugler was playing, I knew God was near. I felt Him in my sister’s hands when she reached from behind me, clasped my shoulder, and spoke words of comfort to me. It’s difficult to thank and praise God while you bury your child, but there were things I was grateful for. I was thankful for all the days we did have William. I was thankful that he lived all his life to the fullest. I could praise God that William accepted Jesus as his Savior. Focusing on all the good things that William brought into our lives helped me feel the nearness of God. Even though the sun has set on life as I knew it, there are bright points of light that shine through the darkness like stars in the night sky. The loss that those of us who knew and loved William have experienced has drawn us all closer together. It’s loosened our hold on the unimportant things in this life, and made us appreciate the things that truly do matter. It’s drawn us closer to the only One who can comfort us. And we have learned just how close the night is to the day, and that has given us the courage to use our time more wisely, to love and live more fully. “Go to sleep, Peaceful sleep, May the Soldier or Sailor, God keep. One of the most tender moments in a young mother’s life is watching her newborn in sweet slumber. I will never – not EVER – forget my last look at my firstborn, whose mortal frame lay in repose but whose spirit was resting in the bosom of my Father. He is safe, now and forever. “Love, good night, Must thou go, When the day, And the night Need thee so? No matter how much we thought we needed William, we need God more. As long as He is on the throne in our lives, all is well. Storms will come, but the Rock of our salvation will remain, steadfast and immovable. And one day we, too, will speed to our rest in Him. from Joy in the Mourning by Leslie Harder. Used by permission. 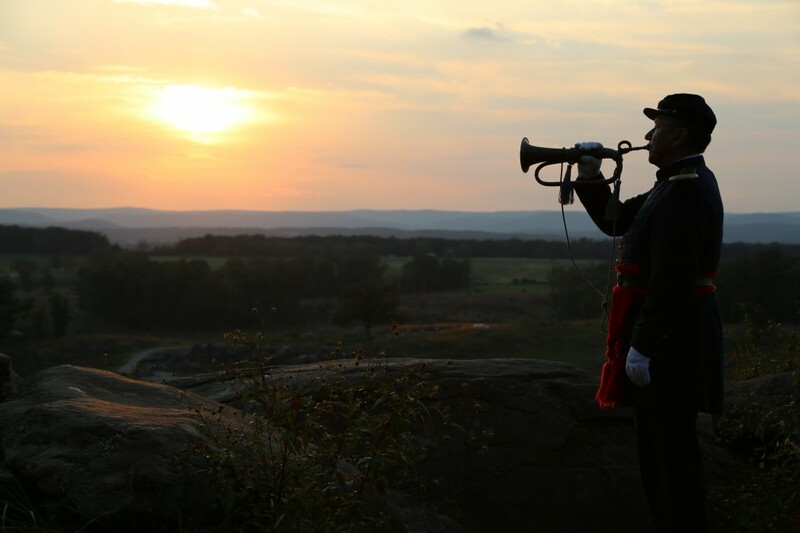 This entry was posted on Thursday, December 21st, 2017 at 11:03 am	and is filed under Bugle Stories, Buglers Through History, General Interest, Getting Started on the Bugle, History of Taps, History of the Bugle. You can follow any responses to this entry through the RSS 2.0 feed. You can leave a response, or trackback from your own site. Wow…..Thank you Jari for TFV and allowing me to contribute. I will work hard to get more buglers in Wisconsin and spread the word!